It should come as no surprise that more people are using their mobile devices to browse the internet than ever before. As social network users continue to migrate to mobile, it’s important that businesses like yours recognize this trend and transition to a mobile commerce solution. Here, we detail where mobile social media is at, where it’s going, and how you can take advantage of this growing trend. Today, there are an estimated 145 million mobile social network users in the United States. That’s up from just 55 million in 2011. Mobile social use has already surpassed PC social use, with 80% of social media time being spent on mobile devices, reports Marketing Land. Worldwide, 967 million Facebook users accessed the social site exclusively from mobile in the second quarter of 2016. That was up from 655 million users just a year prior. Having a social media presence for your business is more important now than ever. According to Statista, 35% of online customers have made a purchase due to social media ads, and 19% have forwarded links to a brand or product website. Social media is a great way to reach new customers and retain existing ones, but brands must now focus on mobile social use. Next year, it’s estimated that 160 million users in the United States will actively use social networks on mobile devices. That’s a 15 million jump from this year. By 2018, it’s estimated that 75% of Facebook users worldwide will access the network through their mobile device. An increase in social network usage, as well as the popularization of mobile technologies, will keep mobile social networking on the rise in upcoming years. Furthermore, mobile will become increasingly important for selling online. In fact, by 2017, mobile internet revenue is expected to hit $700 billion. If you haven’t adopted a mobile commerce solution for social, now is the time to do so. How Can You Adapt to These Changes? Mobile social networking isn’t just about being on social media. It’s about making your offers mobile-friendly for social media users. Luckily, many social media apps already have built-in tools that make posting offers and running ads on their networks easy and mobile-friendly. 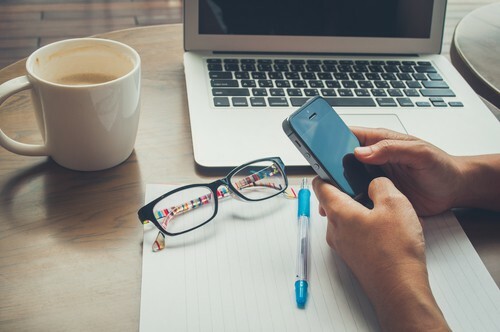 However, not every aspect of mobile commerce can be automated, so it’s important to pay attention to how your posts, offers, and ads appear on various devices. For example, while one image might look great on desktop, it may be difficult to see or read on small mobile screens. Likewise, your links may look good on desktop, but they may be hard to click on if they’re too close together on mobile. Think about how people on mobile will view and interact with your social media posts, and then design them with mobile-first in mind. Another idea is to make mobile users feel elite. Offer them deals if they purchase from your mobile app, for example. Otherwise, target users and their devices in social media ads. For example, Facebook offers you the choice to run your ad on specific phones, such as Android or iOS devices. Show mobile users that they’re valued customers to help give them an incentive to act on those offers. If you have a mobile app, make sure to offer links to your social networks as well to grow your following. And as always, continue to engage with your followers and monitor the discussion on social media to help grow your brand. With mobile social media dominating, it’s time to make mobile commerce on social media a priority.